A father took his son to the zoo. On the way the young boy saw a giraffe, he asked his father if he could come closer. The father took the son closer and even had the zoo keeper give his son a carrot to feed the giraffe. The son was pleased. As they crossed the tiger’s cage the boy asked his father if he could do the same, but the father said no. The boy looked disappointed and asked his father why he could do that with the giraffes but not the tiger. The father responded kindly to his son and said, it may look like it’s the same, but there’s a difference. You need to look closely and you need to understand. Context is everything. To understand where we are at the moment, we need to understand why people took to the street. It is also vital that we understand the differences between January 25, 2011, June 30, 2013 and protests in support of ousted president Mohamed Morsi. January 25 was motivated primarily in response to police brutality. Alongside the objection to brutal police practices, however, there was a desire for real change. Chants for bread and freedom were an integral part of the protests, and the triumph of these demands would have served only the people. January 25 was unparalleled because people were fighting every state institution, including the police. They had no assurances for their safety and they were aware of the high risks of arrest, beatings and even death. In contrast June 30 was less risky. Big protests, as we've learned, are safer, and the police gave assurances they would not attack protesters. That said, the possibility of violence from the Morsi camp remained a risk. Morsi’s supporters are known to have attacked protesters and civilians, long before his removal on July 3. Beyond the support of the security forces, there is a fundamental difference between January 25 and June 30. 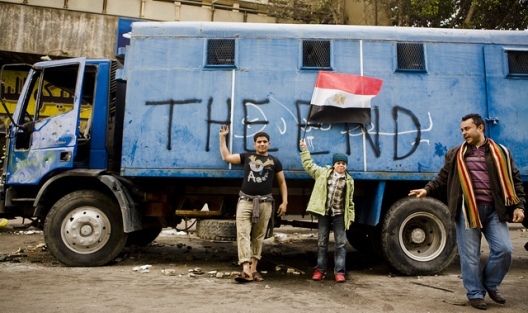 The June 30 protests were boisterous and calls were directed against Morsi and the Brotherhood. Chants for bread, freedom or human dignity were not prevalent in these protests. June 30 was effectively about rejecting what they perceived as a foreign element in Egypt’s body, irrespective of what would come next. While June 30 protests saw unprecedented numbers, this turnout was a direct result of January 25. January 25 activists paved the way, solidifying the idea that street protests could bring about change. These activists never left the streets and seldom stopped opposing the regime in whatever form it took, whether under the Supreme Council of Armed Forces (SCAF) or the Muslim Brotherhood. The idea that June 30 is independent of January 25 is a myth propagated by many who did not support the January 25 uprising. In their efforts to abolish January 25 they have labeled June 30 a new revolution, rather than another wave of the revolution that started two and a half years ago. The support of state elements, including the army and police, was aimed to hijack a movement sparked by activists. The massive turn out to “protest against terrorism” on July 26 may have been in response to calls by General Abdel Fattah al-Sisi, but the numbers could be more an indication of disdain for the Muslim Brotherhood rather than support for Sisi. If nothing else, it was certainly in support of Morsi’s removal. Sisi simply symbolizes a chance to save them from the threat of the Brotherhood. While the media has helped magnify these fears, there is, however, a real threat places like Alexandria,Bein El Sarayat, Manial, Assiut, Sinai, Minya, and governorates across Egypt that have been attacked by Morsi supporters. As for Muslim Brotherhood protests, it is important to note that they are facing a state known for its brutality, but unlike January 25, there is a clear leadership asking a great many of them to take to the streets. The narrow demands call for a return to the old order: the reinstatement of the constitution, and the return of Morsi and the Shura council. Their chants were quickly transformed, as Islamist rhetoric was replaced with anti-SCAF, pro-legitimacy and even pro-democracy rhetoric. This development was, however, prompted from above, and is a fabricated imitation of anti-government protests over the past two years, during which the Brotherhood was noticeably absent. During watershed moments– the massacring of eighty in Port Said, the targeting of activists including Mohamed al-Guindy, Kristy and Jika, of journalists like Al Husseiny Abu Deif – the Brotherhood was busy creating political cover for SCAF or Ministry of Interior crimes. The Brotherhood now calls for the return of an autocrat, one who thanked the police and army for their service, all of which is in direct contradiction with their newly adopted pro-democracy rhetoric. The sincerity of Brotherhood protests is also questioned because of a clear support for autocratic measures set up during the one year of Brotherhood rule. The Brotherhood advocated for a restrictive protest law, which they are now breaking, and also pushed for restrictions on media. The final issue that must be addressed when looking at protests in Egypt is the question of violence. Pro-Morsi protests cannot all be described as peaceful. Some protesters randomly attacked neighborhoods in Cairo and Alexandria and twice attempted to storm Tahrir using firearms where another sit-in was being staged. When pro-Morsi sit-ins were forcefully dispersed, over fifty churches, andChristian homes and businesses attacked in retaliation. While violence has been witnessed in pre-July 3 protests, the violence primarily targeted state actors. Protesters were careful not to affect private property or the interests of ordinary citizens. The anti-military movement Kazeboon staged screenings in public squares of human rights violations perpetrated under SCAF and the Muslim Brotherhood, but were careful not to steal electricity, or damage private property. When met with strong resistance, protesters did not attempt to confront residents of an area. They did not ransack mosques or churches. When the Institute of Egypt caught fire during clashes between protesters and security forces in December 2011, protesters formed a human chain around the building after the fire was extinguished. Violence and polarization on the street has escalated to an extent which has hampered meaningful protests in support of ideas rather than entities. It is not possible to protest against state crimes without being associated with the Brotherhood, and it is no longer possible to protest against the Brotherhood now that they’re out of power without being associated with the army. The space created by the January 25 uprising is being reclaimed again by repressive forces that are fighting for power, rather than an enforcement of values. With Brotherhood protests dying down, and police empowered through anti-Brotherhood sentiments, we can expect the streets to remain relatively quiet for some time to come, until the perceived Brotherhood threat is averted. There will come a time when the unreformed state and the unfulfilled demands of bread, freedom and social justice will drive people to protest. For those who refuse supporting the false binaries of army or Brotherhood, now is a time to adopt ideas rather than entities or people for the next time protests kick off. But by that time, how much consensus is built over these ideas and how much of stronghold the security apparatus would have garnered will determine the nature of these protests.